Toyota CEO Akio Toyoda offered rare personal insights during a meeting with investors in Nagoya. The event was part of his push to sell his corporate revival plan to the public and build shareholder trust. TOKYO -- Toyota Motor Corp. chief Akio Toyoda undoubtedly wishes his company’s unintended-acceleration crisis never happened. But in a rare moment of public reflection on that period, he credited the worldwide upheaval as the turning point in his career, even as he fretted about being fired from the CEO suite. “I was resigned to the possibility my presidency could end soon, making my tenure as president a very short one,” said Toyoda, who had been in office for less than a year at the time. “I felt I wouldn’t last another year as president,” he said. Toyoda offered the candid insights during the carmaker’s biggest ever meeting for individual investors. Held Sunday in Nagoya, the event was part of a new push by the CEO and president to sell his corporate revival plan to the public and build shareholder trust. The roadshow, which featured a meet-the-CEO fireside chat with a Japanese television newscaster, was chock-full of confidential insights into the man whose grandfather founded the company and loaned the family’s name to what is now the world’s top carmaker. He uses an “oxygen capsule” to recover from jetlag. When he was a child, he didn’t know what kind of work his father did; instead, Toyoda wanted to be a taxi driver. When he finally did join Toyota, he ate noodle soup every day for lunch, alternating between ramen and udon. He keeps a “Dennis the Menace” cartoon from his early years as a reminder that “customers are too good to lose; let’s keep them happy.” But he doesn’t know who the cartoon character is. His blood type is A. In Japan, where blood types are believed to indicate personality traits, like signs of the zodiac, Type As are ambitious, conscientious and perfectionistic. Despite being a scion of the founding family, Toyoda was the first family member to join the company as an entry-level employee. While other kin entered as executives, he joined at age 28 in parts procurement after working at a U.S. investment bank. “I was told to join Toyota that way,” he said. His father, former President and current Honorary Chairman Shoichiro Toyoda, warned him that no one would want to be his supervisor. Yet, the weight of family ties fully registered with Akio only during the 2009-10 unintended-acceleration crisis, when Toyota recalled millions of cars globally to fix sticky acceleration pedals and floor mats that could cause cars to speed out of control. The public relations debacle climaxed Feb. 24, 2010, when Toyoda was hauled before a U.S. congressional panel and given a humiliating grilling about his company’s response. At the investors meeting, the company screened video clips of lawmakers scolding the beleaguered CEO. Indeed, Toyoda -- who was initially criticized for not being more proactive in reacting to the crisis -- said he boarded the plane to Washington with deep trepidation. Toyoda said he didn’t expect to last another year at the helm. The comment raised eyebrows in Japan. Indeed, his grandfather Kiichiro opted to spell the company’s name Toyota, instead of Toyoda, partly to divorce it from an overt family connection. But Akio Toyoda, as the third family member to lead Toyota, realized this nuance was lost on a lot of customers around the world. “The gravity of this name, Toyoda, is something that I felt very keenly when I attended the congressional hearing,” he said. “Then, for the first time since joining the company, I felt a strangely positive sense of purpose and usefulness,” he added. Another epiphany came when Toyoda later debuted on “Larry King Live,” his first appearance on a live television broadcast -- and before a largely hostile foreign audience no less. The disarmed disclosure, Toyoda said, triggered a wave of well-wishers writing in to the company to profess their excitement that Toyota Motor was finally headed by a true-blue car guy. “I had conveyed my real feelings,” he said. 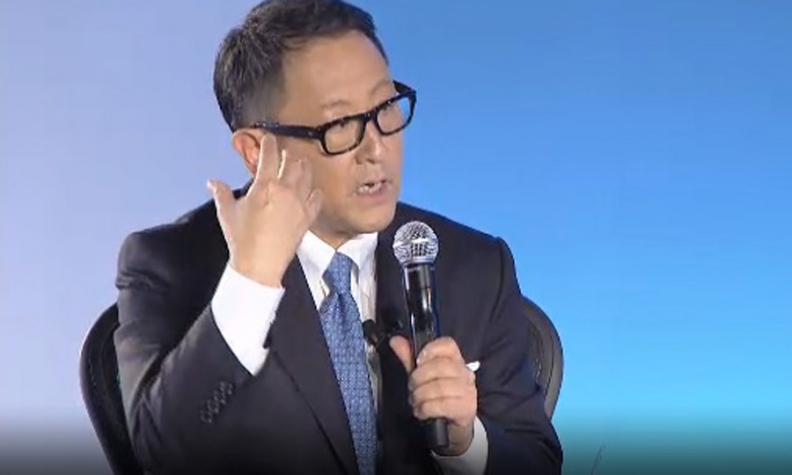 At the investors meeting, Toyoda outlined his post-recall mission to create a car company that can grow sustainably, without the overreach that triggered past quality problems. He outlined plans to develop cars through the introduction of a new, common product platform known as TNGA. He emphasized the company’s redoubled focus on cultivating quality employees. And Toyoda previewed the company’s vision for the long-term future, a world it is preparing for with small personal mobility devices, partner robots and hydrogen fuel cell vehicles. Yet even at home in Japan, Toyoda doesn’t necessarily command the same recognition he garnered in the U.S. during the recalls. At one point in the investors meeting, the company showed a video of man-in-the-street footage asking regular Japanese whether they could identify the head of their country’s biggest manufacturer. Most couldn’t. And comically, one young man suggested it was the “owner” of the company, Carlos Ghosn. Ghosn, of course, if the French boss of rival Nissan Motor Co.
Akio shrugged off his low profile saying it’s not important people know his name, just the names of the company’s cars. At another juncture in the event, the company projected some of Toyoda’s notable quotables onto a screen to fire up the crowd. Each animated quote exploded before the next text graphic appeared, set to the crescendoing strains of Ravel’s Bolero.